One thing that will never change about the business world is the presence of risk. But risk management has changed dramatically since the 2008 financial crisis...and new developments in technology and communications demand up-to-the-minute approaches for defending against threats - and seizing opportunities. Packed with practical exercises and fresh case studies from organizations such as IBM, Microsoft, Apple, JPMorgan Chase, and Sony - as well as new material on topics including the new role of risk owner, cutting-edge collaboration methods, and the upside of risk - this critical guide provides listeners with the tools and information they need to keep their organizations as blissfully risk free as possible. Would you try another book from John J. Hampton and/or Steven Menasche? I would never buy from this author again and don't recommend anyone buying his spam / advertising books. What was most disappointing about John J. Hampton’s story? This was the worst audio book I have ever listened to on Audible - full of hours and hours on end of advertising of his software products - irrelevant stories and chapters, wikipedia-style definitions instead of actual information that is usable... There were at least 4 hours of advertising of his software services / programs that he sells. I would advise anyone to stay away from this piece of software advertisement. This has a very corporate, "PowerPoint-ish" tone and feel to it. But it does give a useful look at the basic mapping processes and dedicated tech tools we can expect in this environment. It mentions Nassim Taleb and "The Black Swan," though it seems to miss or ignore some of his critiques of tools and methodologies such as we see here. It would be easy (all over again; remember the problems with over-reliance on VAR?) to be mesmerized by slick tools and data confections (the term "narrative fallacy" springing to mind). But that was always true, and is the fault of the humans in the loops, as these tools here are quite flexible and can, in the right hands, be very useful. This is my first look at ERM, per se, and I feel well served here. I certainly want an enterprise I invest in, or rely on, to have a good grip on these sorts of things. The environment has too many variables now to merely fly by the seat of one's pants. Audio customization and tecnical details are crear enough. I might repeat the record several times to catch details. 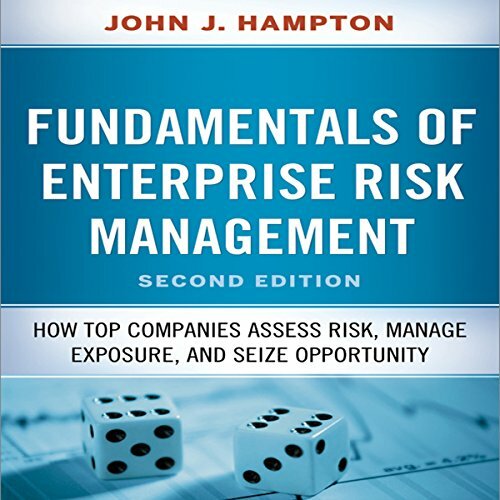 I liked it a lot you had great information about risk management but there's a lot of information and it's worth reading a second time.